The show starts out with the snake wrangler standing in our specially designed glass inclosure with rattlesnakes crawling freely around his feet. Although his legs are clad in snakeproof chaps it's impressive to see the rattlers crawling freely around him with their fangs and venom intact. 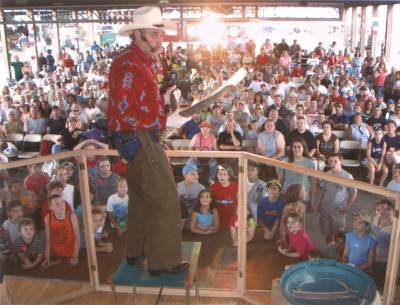 Once the snake wrangler has introduced himself he then lifts the rattlers individually (with specially designed snake tongs and hooks) to introduce each one to the crowd. During the introduction the snake wrangler announces in an amusing tone that if it were not for him these rattlesnakes would be boots and belts by now (a fact that is absolutely true). There is one rattler that with a little assistance does a perfect impression of a "caduceus" (the American Medical Association insignia). This is a clever and appropriate introduction to an anti-drug message. The content may very, but the anti-drug message is most effective. Next is a demonstration of how to use the hooks, tongs, and tubes when dealing with venomous snakes. By the end of this segment the audience is educated in the art and practice of safely handling rattlesnakes, and are shown how veterinarians, laboratory workers and research workers all handle venomous snakes. while doing this demonstration facts are given about the rattle, age and the gender of the rattlesnake. The show concludes with a spectacular display of a rattler actually striking and popping a balloon with lightning speed.